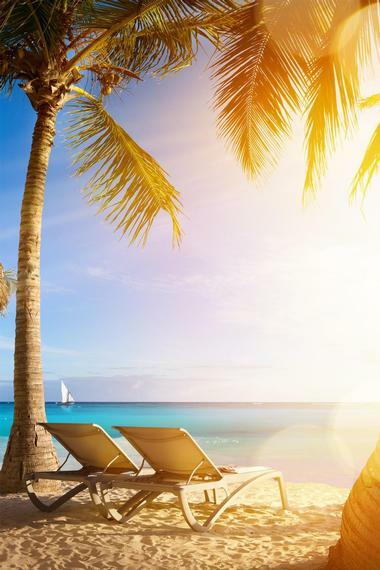 The Caribbean island nation of Jamaica is known today as one of the leading resort areas in the world, offering pristine white sand beaches, lush tropical destinations, and internationally acclaimed reggae music culture. A wide variety of all-inclusive resorts cater to visitors of all ages, including family activity complexes and intimate getaways for honeymooners. Resorts throughout the tourist-friendly areas of Montego Bay and Negril are known for their award-winning restaurants, rejuvenating spas, and private beachfront areas offering outdoor activities such as snorkeling and kayaking. Whether you’re looking to entertain youngsters with action-packed itineraries or enjoy luxury amenities like championship golf courses or equestrian facilities, Jamaica’s hotels and resorts offer the perfect all-inclusive package for every visitor. 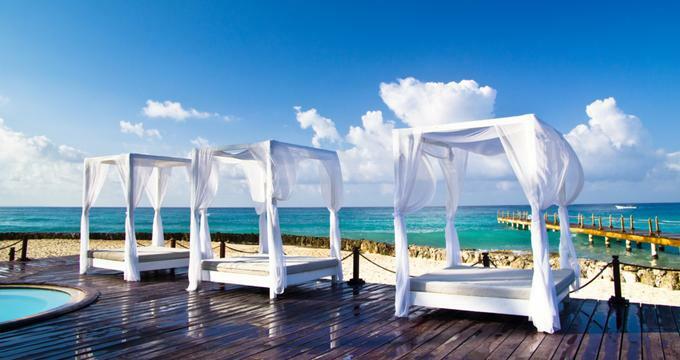 Azul Beach Resort Sensatori Jamaica is located along a prime stretch of Jamaica’s world-famous Seven Mile Beach and offers a visitor hideaway on pristine white sands. The 285 ocean view suites feature amenities such as king-sized Bali beach beds, plasma screen televisions, fully stocked minibars, and rainforest-style showers and are divided into family and adults-only areas, providing uninterrupted romantic getaway experiences and supervised activities for young travelers. Gourmet Inclusive® packages offer 24-hour room service and full meal packages at the resort’s 18 restaurants and bars, which serve traditional Jamaican and gourmet international cuisine. 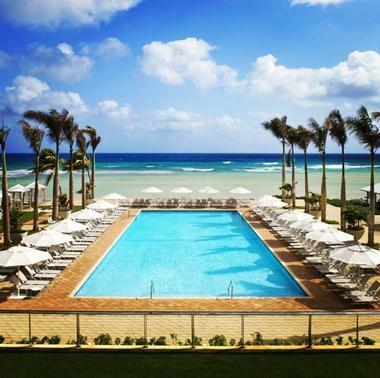 Onsite amenities include seven pool areas, a world-class spa and fitness center, and live nightly music and entertainment. Young visitors can enjoy Silly Science Lab and My Gym programming at the Azulitos Playhouse, while adult guests can participate in daily yoga, water aerobics, dance, and cooking courses. 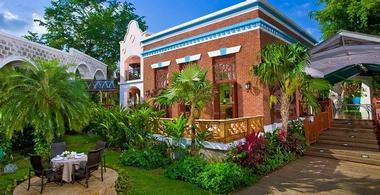 Beaches Negril Resort and Spa is a plantation-style resort landscaped with lush tropical foliage and intimate walkways. The resort is located approximately an hour southwest of Montego Bay International Airport along Negril’s Seven Mile Beach and boasts more than a dozen categories of Caribbean-style luxury suites, including beachfront and oceanfront accommodations for couples and families. All-inclusive use of the resort’s water equipment is available for guests, including snorkeling gear, water bikes, and Hobie Cats. Nine world-class restaurants serve international choices and American favorites such as fresh seafood and wood-fired pizzas. The 18,000-square-foot Pirates Island Waterpark is offered, along with a teens-only nightclub, an Xbox play lounge, and Sesame Street® themed activities for young visitors. Beaches Ocho Rios Resort and Golf Club is the perfect Jamaican getaway for golf lovers, offering a Sandals Golf and Country Club that has been praised by Golf Digest as one of the top golf clubs in the country. The club’s 18-hole professional course is located more than 700 feet above sea level and offers spectacular mountain and ocean views along with putting and chipping greens, a pro shop, a practice range, and several restaurants. It boasts the country’s only all-inclusive golf program for children, earning it a distinction on Parents magazine’s list of Top 10 Best Beach Resorts. Family-friendly surf-and-turf fun continues at the resort’s Pirates Island Waterpark, which offers 27,000 square feet of water slides and children’s play areas. 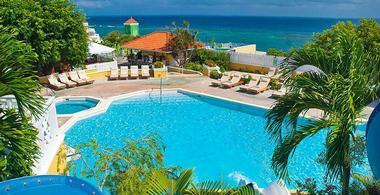 Bluefield’s Bay offers visitors all the perks of an all-inclusive resort without any of the commercialism. Six uniquely designed villas are available, ranging in accommodation size from two to six bedrooms, and can be combined for larger rentals for private and corporate groups, including wedding parties. Gourmet meals are included with rental packages, prepared by personal chefs to match guests’ tastes, and are served within private villa dining rooms by a butler. All activities are jointly planned by visitors and staff managers to reflect guest interests. Onsite nannies are available to entertain young visitors daily while adults relax on private waterfront patios and pristine beach areas. 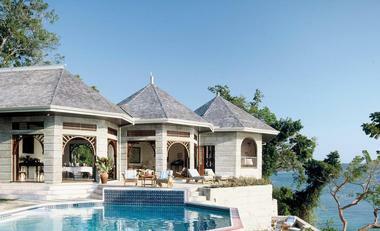 Franklyn D Resort and Spa employs an all-Jamaican staff to fully immerse visitors in local culture and atmosphere. As the only all-inclusive traditional resort in the country to offer full nanny service, the resort is known as one of the premiere family-friendly resorts in the Caribbean and offers a kids’ camp and daily youth activities. A water park area boasts the 100-foot Big Blue slide, while a variety of sports fields and lessons provide active play opportunities. Adult visitors can wind down at the resort’s premium bar, which serves high-quality and local spirits and rums, or be pampered with luxury treatments at the Sea Grape Spa. The resort is a 20-minute drive from the town of Ocho Rios, which is home to the much-photographed Dunn’s River Falls and the Mystic Mountain adventure park. 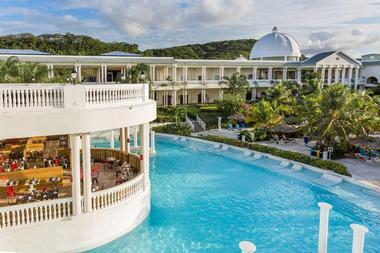 Grand Palladium Jamaica Resort and Spa adjoins the Grand Palladium Lady Hamilton Resort and offers modern luxury amenities designed in harmony with its surrounding natural mountain enclave. 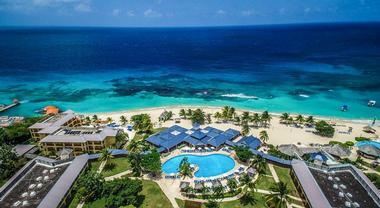 The resort is located along Jamaica’s northern coast near Montego Bay and features four outdoor swimming pools and oceanfront activities along a stretch of pristine white sand beach. There are 88 full suites and 449 junior suites available, offering late-night room service and luxury amenities. Seven a la carte and three buffet restaurants serve Jamaican, American, and international fare, and 16 bars pour high-quality spirits and rums. 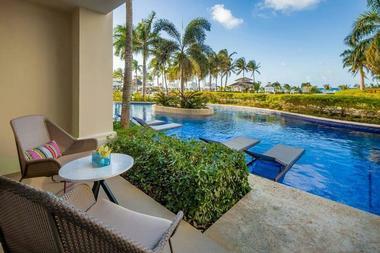 Private beauty salon, supermarket, boutique shopping, and medical facilities are provided for resort guest use. Other features include a spa and wellness center, a water park with a children’s play area, and a complimentary children’s club for young visitors. Grand Pineapple Beach Negril is one of the premiere all-inclusive resorts along Negril’s Seven Mile Beach, which is considered one of the most scenic stretches of beachfront in the world and is known for its luxurious white sands and spectacular panoramic sunsets. Quaint and luxurious garden-side and beachside suites along Norman Manley Boulevard offer amenities such as cable televisions, coffeemakers, balconies, and patios. International cuisine is served at the resort’s Orchard Terrace beachfront restaurant, which offers breakfast, lunch, and dinner buffets with specialty daily cuisine themes. Unlimited drinks are served at the resort’s bars, and daily live entertainment showcases local Caribbean musicians and performers. Snorkeling, sailing, kayaking, and windsurfing are popular along the beach, while beach volleyball, lawn chess, and table tennis are offered poolside. Holiday Inn Resort Montego Bay offers all-inclusive resort luxuries provided by one of the world’s most trusted hotel chains. 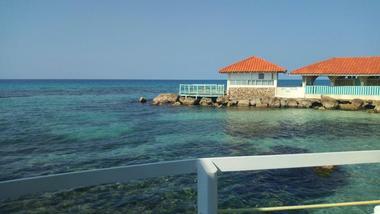 The resort is located along Montego Bay, Jamaica’s second-largest tourist destination, which is home to Aqua Sol Theme Park and the protected Montego Bay Marine Park natural marine reserve. There are 518 guest suites available, including adults-only Rosehall Club accommodations and KidSuites rooms, which feature suite-within-a-suite areas for young visitors. Italian, Japanese, Caribbean, and American buffet and a la carte fare is served at the resort’s restaurants, while full bar service is offered at lounges and poolside bars. Rejuvenation packages are offered at the Sol-Mer Spa and Salon, which is located within the resort’s lush garden courtyard. Hotel Riu Palace Tropical Bay is a 24-hour all-inclusive hotel managed by RIU Hotels and Resorts, offering more than 400 guest suites with minibars, satellite televisions, and private balconies and terraces. The resort has been awarded GOLD certification for its implementation of the Travelife Sustainability System, which promotes sustainable and ethical tourism practices. The park is also closed to spring breakers, creating a calm, relaxing vacation environment for visitors of all ages. Two swimming pools offer a whirlpool bath area and poolside bars, while the resort’s direct beachfront access provides opportunities for swimming, snorkeling, and watersports. International cuisine and Jamaican barbecue fare are served at luxury restaurants, and rejuvenation packages are available at the Renova Spa. Activity programs include children’s zone programming and guided excursions to top Jamaican natural sites such as the Roaring River and the Great Morass. Hyatt Ziva Rose Hal is an all-inclusive Montego Bay resort offering 277 guest suites with a variety of unique luxury amenities, including direct swim-up rooms and suites with personalized butler service. Unlimited dining at the resort’s restaurants, bars, and coffeehouses is included with all reservation packages, including unlimited alcoholic beverages for guests 21 and older. Private dining experiences may also be reserved at the resort’s intimate gazebo facility. 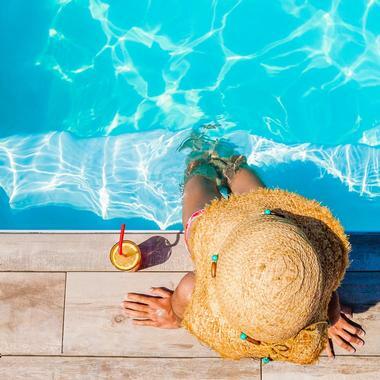 Active and quiet relaxation pools are available, along with a 24-hour gym and exercise classes, two par-71 golf courses, and indoor and outdoor sport and gaming areas. Nightly music and entertainment performances are presented at the resort’s outdoor theater, showcasing local reggae bands and international performers. Iberostar Rose Hall Beach offers five-star accommodations near the historic Rose Hall mansion, Jamaica’s most famous estate. The resort is located along a stretch of pristine beachfront and is landscaped with lush tropical foliage, immersing guests in the traditional culture and atmosphere of the island country. 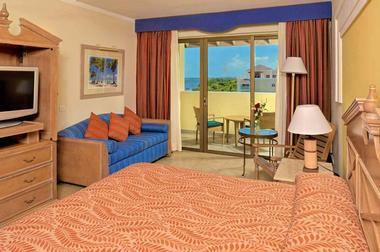 A variety of guest rooms are available, including suites with beachfront and oceanfront views and luxury amenities. All-inclusive packages offer access to the resort’s three restaurants, which emphasize Cajun and Japanese cuisine, along with beachfront and swim-up bars serving premium alcoholic beverages. Live theatrical performances and film showings are offered daily, and a kids’ pool and club area are provided for young visitors. 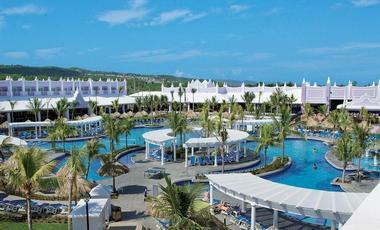 Jewel Runaway Bay Beach and Golf Resort is an all-inclusive tropical playground offering a variety of island resort accommodations, including an 18-hole championship golf course that has hosted major events such as the Ryder Cup and the Jamaica Open. Jewel Lagoon Water Park offers a 5,000-square-foot oceanfront sunning deck, a scenic lazy river, and water slides and splashdown pool areas. Seven casual and fine dining restaurants highlight international fare, with 24-hour room service available in all suites. Excursion packages are available to explore Jamaica’s top natural and tourist attractions, and day passes are offered for visitors wishing to experience resort attractions without booking an overnight stay. 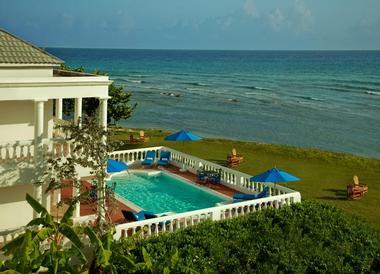 Moon Palace® Jamaica is one of Jamaica’s most-lauded resorts, located on 400 acres of landscaped tropical grounds featuring a 2-mile stretch of beachfront. The resort is noted for its award-winning Fern Tree Spa, which offers a tea room, meditation gardens, an outdoor yoga pavilion, and aromatherapy steam rooms. Onsite restaurants include the Sugar Mill, voted as Jamaica’s top restaurant, which showcases the historical water wheel of the Rose Hall sugar plantation estate. Novice and expert riders of all ages are welcome at the Half Moon Equestrian Centre, and the par-72 championship golf course designed by golf pro Robert Trent Jones Sr. has been rated as one of the world’s best walking courses. Rose Hall Resort is owned by internationally acclaimed resort chain Hilton Hotels and Resorts and offers all-inclusive experiences within the grounds of the 18th century Rose Hall estate. 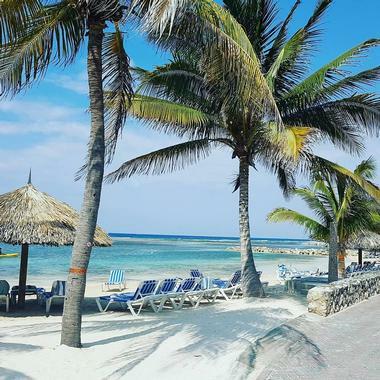 The hotel boasts the largest private resort beach in the country, along with an oceanfront swimming pool and Sugar Mill Falls Water Park, which offers exciting water slides, lazy river areas, and a jungle garden with a historical replica suspension bridge and aqueducts. Unlimited access to the nearby White Witch and Cinnamon Hill golf courses is offered with the Golf Play and Stay packages, and shuttle service to nearby Rose Hall attractions is provided with all stays. The Kidz Klub is available for young visitors, including children 5 and under, who are admitted to the resort free with a paying adult guest. 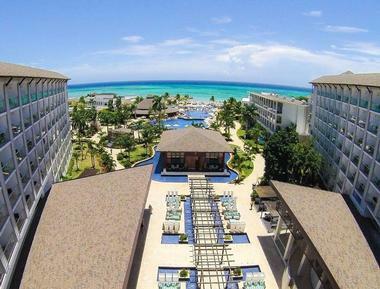 Royalton White Sands is located half an hour from Sangster International Airport within Montego Bay and offers 352 guest suites featuring oceanfront and garden views and luxury amenities such as exclusive Royalton Dreambeds. Three swimming pool areas include a splash pool exclusive to young visitors, while exclusive beachfront areas offer opportunities for snorkeling, surfing, and watersports. Unlimited Hassle-Free Dining experiences and 24-hour room service are available from the resort’s five specialty restaurants, which highlight Mediterranean, Asian, Italian, and West Indies cuisines, and six bars serve internationally themed cocktails. High-tech amenities are offered throughout the resort, including free Wi-Fi, USB recharging stations, and Bluetooth audio stations.